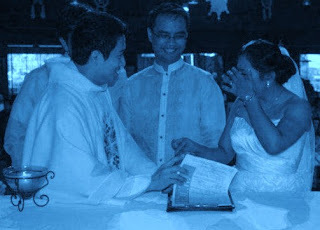 I have some married friends who have confided that listening to priests preach at weddings has always fascinated them - though they've also sometimes found it quite odd - for the simple reason that priests are somehow expected to impart words of advice and wisdom to two persons who are about to spend the rest of their lives together—something we ourselves will never get to experience. To them I’d always reply that while they make a very good and valid point, the fact is, if one were to dig just a little deeper, he would see that the lives we have chosen and the love we profess – those of married couples and those of priests, are really not that different. It was the most sincere, honest, and straightforward answer I could give. But then I had to explain. There's something that isn't too easily given to articulation, whether in a sentence, a mathematical equation, or a scientific formula in the experience priests and married couples share: giving ourselves in love to something or to someone other than ourselves. And that’s the first thing to remember about love, when it’s real. It has no “why.” It just is. That’s why it’s called “falling in love” – because you really don’t know why, and you don’t know where it will ultimately lead. You simply have a very deep conviction that it is right, and you go with it. In short, it involves a very genuine risk - a “leap of faith” into the arms of the person you love. I answered him this way. There are three types of persons in this world. (i) Runners – those who flee, (ii) watchers – those who sit on the sidelines, and (ii) risk-takers – those who commit. Those who run are afraid of failing or getting hurt, they fear the challenges that commitment brings, and so they run away. Those who watch are the fence-sitters, also afraid of failing or getting hurt, but are fascinated by those who are in the game. Runners and watchers may never get hurt, never experience pain, but they will also never experience the thrill, the joy, the exhilaration of succeeding. Risk-takers get hurt, they get wounded, and they can in fact fail, but they’re the only ones who know what true victory and triumph mean. And they’re the only ones who will truly know what falling in love with another person or with life truly brings. My friends, the two of you, together, have chosen to be the third type of person. You have chosen to commit to one another, not for a day, not for a month or a year, or a decade, but for life. And so now, I speak to you both, not so much as a priest giving advice, but simply as a brother in Christ, who like you has chosen to take the risk of committing to something, to someone for the rest of our lives. Jesus speaks to you both, to us all, of love, in today’s Gospel reading. And there are three things I would like to share with you about this love of which he speaks. First, always remember that genuine love is neither mere feeling nor sentiment; true love is a commitment. It’s a commitment of one’s whole being: heart, mind, body, and soul. Love is not simply passion, romance, emotion, and fascination – these are all important parts or aspects of love, but in themselves, they aren't love. Love is something larger; it’s a commitment to the other, not a mere matter of the heart, but a matter of heart and mind, body and soul. And it’s a commitment that has to be renewed every time you wake up in the morning and before you go to bed at night. There will be good days and not-so-good ones, there will be mountains and valleys, plateaus and plains. Love sticks it out, through thick and thin. On a practical note, seek to grow in knowledge of one another daily, seek to become the best of friends. Second, never lose sight of the fact that genuine love removes its gaze from oneself and keeps it on the beloved. Love means putting the other in first place and oneself always in second; it reverses the usual order by which we understand and do things. The self seemingly disappears when one truly loves; the good of the other becomes one's primary concern. And yet there is a paradox involved in true love, namely, that in losing our self in the person we love, we find our self even more. The self isn’t gone; it doesn't disappear but is instead made whole. In losing ourselves in the person we love, we find ourselves even more; and we are made complete. Nor does love end when one finds fulfillment and wholeness in the person he or she loves. Instead, love becomes even more complete, even more grand when the love two people bear for one another expands and reaches out to even more persons. For a husband and wife, this means love extending towards the children they shall have, as well as the society and world in which these children are going to be raised. One a practical note, remember to always put your beloved first: think first of what will make him happy, of what could make her sad, and of what would allow his heart and soul to take flight. Be always thoughtful, mindful of each other. And third, always bear in mind that your love for one another must mirror Christ’s love, because all human love, no matter how exalted, is imperfect and finite. Love means forgiving over and over and over again. But it also means avoiding hurting the other over and over and over again. In this it must mirror Christ’s love which never ceases to forgive but which also anticipates our needs. Remember that you are marrying an imperfect human being, great and awesome in many ways but imperfect nonetheless. And that’s perfectly alright, because in many ways, that is what marriage is about: two imperfect human beings, perfecting and completing one another, and growing and maturing as man and woman together. Anchor your love, your marriage in Christ, and do not be afraid to take as many "leaps," as many "risks," as you have to, as a couple, as friends; and do not be afraid to "fall in love" with each other again and again - God will always be there to catch you.